11 steps to the perfect Toronto tattoo. If you have a tattoo, are interested in getting a tattoo, or are at all familiar with tattoo culture, you’ve probably noticed the dramatic spike in the number of Toronto tattoo shops. With the ever-increasing popularity of tattoos in popular culture, it’s no surprise that there would be increasing supply to meet the growing demand. But the problem is—ANYONE can open up a tattoo shop in Toronto. So how do you figure out which shop is the best fit for you, and how do you choose an artist? If you’re looking for a Toronto tattoo studio or artist, it has never been more important to do your research. To help you do this, you also need to know what to look for and which questions to ask. Choosing an unskilled artist or poorly-run shop can at best leave you with a terrible looking tattoo—and at worst—an infection or illness. 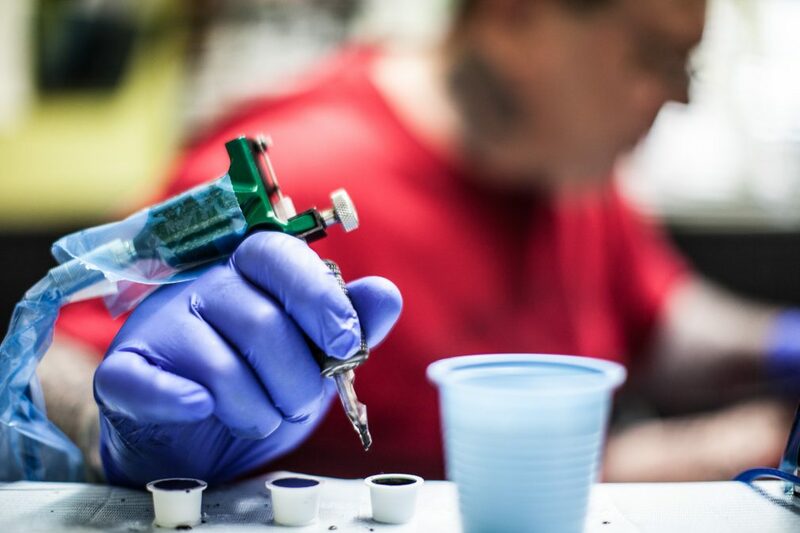 So today we are going to break it all down for you, with 11 ESSENTIAL things you need to know about the tattoo industry. We will also be sharing important tips to help you make an informed decision, to make sure you get a great, safe tattoo. It shouldn’t come as a surprise that when it comes to tattoos, you get what you pay for. And what seems like a good deal at the time, may become your biggest mistake. From the artist’s training—to the quality of the ink and equipment, there are many elements involved in a good quality tattoo. There can be are vast differences between shops, from the artist’s experience to how health and safety procedures are managed. There is little regulation for the tattoo industry in Ontario—aside from basic health and safety inspections. The industry is essentially open for anyone to become a tattoo artist, and the licensing required is as simple as paying a fee and passing a background check. There is no required education, and a shop simply needs to pass safety inspections to remain open. So with so much choice and little oversight, this can make the task of choosing a tattoo parlour difficult. With all of the options out there how can you make sure you are getting a well-done, and most importantly, a safe tattoo? Unfortunately, there is no way to be 100% sure about any shop. BUT, the good news is, it has never been easier to do research. This is probably the most important tool you have, and it’s pretty easy (keep reading). What used to be an underground culture, with its own unwritten set of rules and ethics, has become an open, mainstream industry. With that, there are many who see tattooing as just a way to make money, rather than a passion and a life-long discipline. The old-school Toronto tattoo artists and shop owners still stick to these ethics, with an unwavering dedication to the craft. No tattooing children. This is pretty self-explanatory; anyone under 18 must be accompanied by a parent. Even then, it is up to the artist’s discretion whether or not to do the tattoo. No tattooing of the neck or face until there is significant coverage on the rest of the body. Face and neck tattoos must be earned. Only skilled, well-trained artists are hired (no sub-par work). A tattoo parlour’s reputation lies mostly in the hands of its artists. A reputable shop is only going to hire well-trained, talented artists. A deep respect for the art and craft of tattooing. Tattooing is not just done for the money, it is life-long dedication to an art form and culture. Being a professional tattoo artist is about more than just doing a job—is about being part of a culture. Tattooing is a way of life. As part of tattoo culture, professional artists and shops are invited to and participate in tattoo conventions around the country. A professional artist has completed a proper apprenticeship, where he or she has studied from another professional or professionals in the industry. This is how an artist really learns the craft, as well as the other aspects involved in running a shop. Learning the business and proper health and safety procedures are all part of a good apprenticeship. Well, this is not to say that every shop needs to stick to all of these rules to be considered a “good shop”. But you certainly want your tattoo done by an artist that cares about the craft, and a shop that takes the art of tattooing seriously. It is an art, one that uses the skin as a canvas. As with any type of art, there are talented artists, and not so talented artists. There are also artists that excel in a certain style of art, but not another. Think of it like this: if you were looking for a realistic portrait of a family member to hang in your living room, would you hire an artist that specialises in abstract landscapes? The same goes for tattoos. Tattoo artists develop a style over time, as does any artist. Some specialise in realism, traditional tattoos, watercolour, etc. Be sure to take a careful look through your potential artist’s portfolio to make sure he or she has experience with the type of tattoo you want. Also, talk with the tattoo artist beforehand to make sure you are both on the same page. And don’t be afraid to ask questions! A professional artist will be happy to answer any questions or concerns you have beforehand. As mentioned above, a tattoo is a piece of art, and your skin is the canvas. You will have to live with the decision forever. 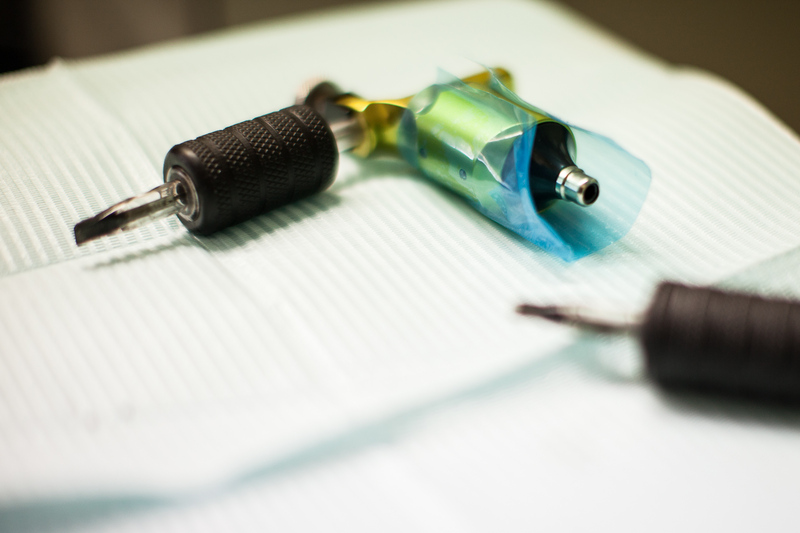 Yes, you can have a tattoo removed if you don’t like it, but the process is painful and can leave permanent scarring. There are certain things you can get away with saving money on, a shirt, a pair of shoes. Buying a cheap piece of clothing that falls apart will not have much effect on your life. A badly done tattoo, however, can be devastating. Tattoos are an investment in art, and your body. So plan ahead, do your research, and budget appropriately. Because a good tattoo is an investment, it stands to reason that a good tattoo artist is not cheap. 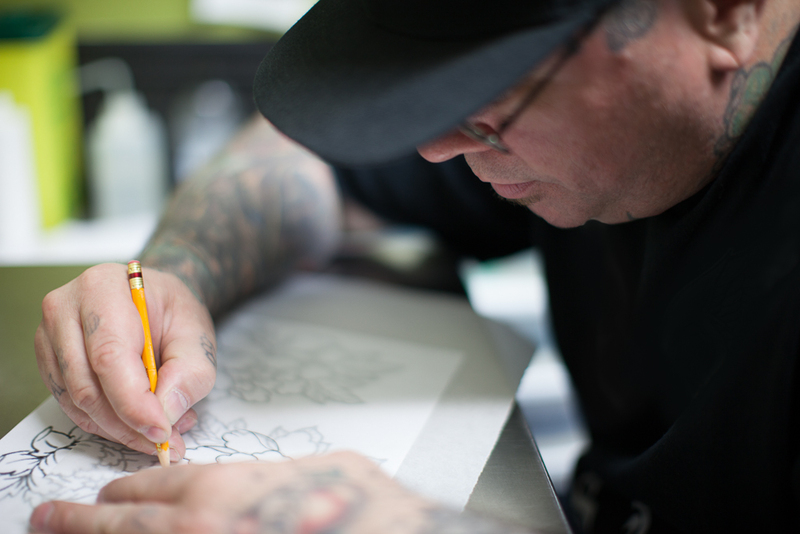 It takes years of apprenticeship, training, and practice to become a skilled tattoo artist. And the hourly rate will reflect this. As with any professional in pretty much any industry, the more experience and skill a person has, the more money he or she is worth. Tattoo artists are no different. A skilled artist will generally charge at least $150/hour, and can go up to several hundred dollars/hour. Also, most shops will have a minimum in place—$100 is pretty normal. Tattoo equipment and supplies are expensive. A minimum charge helps ensure that the artist does not need to cut corners when completing a small tattoo. Now this sounds like a lot of money, but remember: this is your body, and it is permanent. A good artist will not only have the artistic skill to give you a nice looking tattoo, but will also have the experience to guide you through the entire process. Sometime the shape or size of a certain tattoo will not be appropriate for every body. An artist with experience will be able to assess your idea beforehand, to ensure it is right for you. Making the proper adjustments to fit the tattoo properly to your body is also a skill you want your artist to have. When working with a tattoo artist, especially for a bigger piece, a relationship is developed. It can sometimes take years to complete a tattoo. ALSO: good quality tattoo equipment and inks are expensive. This cost is part of the overall cost of your tattoo, and you certainly want your tattoo artist using good equipment and supplies! Great artists have to start somewhere, and can only become great artists with practice. So if you have your heart set on a newer artist, or really want a tattoo but can’t afford to pay a high rate, don’t despair. There are lots of great shops out there apprenticing some good emerging artists. Just make sure that new artist is being apprenticed by a trusted professional in a good shop. A successful tattoo is one that not only looks good, but is safe. A professional shop will have strict health and safety procedures in place. 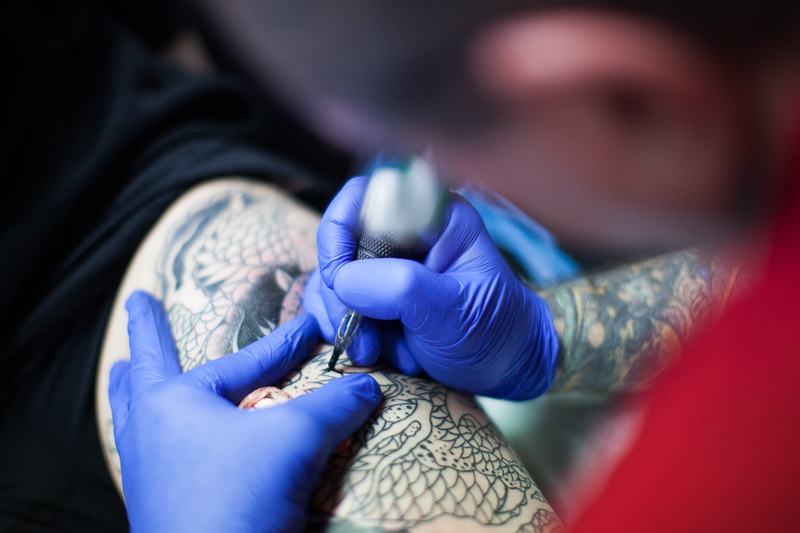 Professional tattoo artists will have training to avoid cross-contamination and blood borne illnesses. Serious viruses such as Hepatitis C can be contracted when proper health and safety procedures are not followed. Although many tattoo artists now use plastic disposable tubes, some still use metal tubes. For those using metal tubes, they must be sterilized in an autoclave after each use. As required by law, Toronto tattoo studios must sterilize their tattoo equipment in an autoclave. Autoclaves must also be tested bi-weekly to ensure proper function. An important aspect of health and safety is also after care. 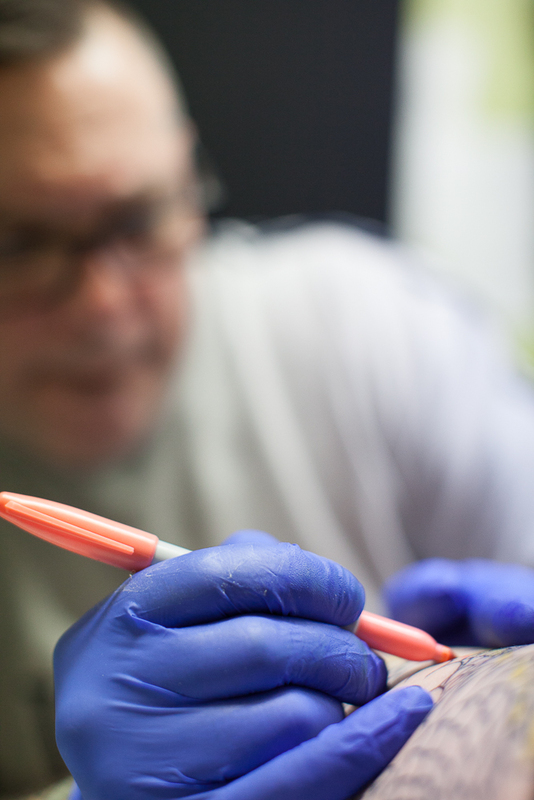 Your artist should properly explain the after care process, which will not only help you avoid infection, but also help prolong the life of your new tattoo. All legitimate tattoo parlours are also subject to regular inspections by Toronto Public Health. These are done by city inspectors using a checklist of over 40 separate items. Everything from hand hygiene, to proper needle disposal procedures are evaluated. Interestingly, tattoo studios actually have stricter health and safety regulations than cosmetic surgery clinics. Tattoo shops must also display their inspection grade in a highly visible area (most put it in the front window). When the autoclave is tested, these tests are sent to a third party facility. The results are then returned to the shop. Should the tests fail, a series of 3 consecutive tests must be done and passed before the autoclave can be approved for use again. Then, all instruments must be re-sterilised. An autoclave works by heating the instruments inside to at least 250° F, for 15-20 minutes (depending on the number of items inside at the time). The Health Department requires shops to keep all records of the dates and logs of their autoclave tests. Although not required by law, it is good practice for a shop to make these records available to customers upon request. Protect your health and ask to see records beforehand! A good tattoo artist will only use good quality tattooing equipment. A better tattoo machine will be made from quality metal and parts, such as the springs and coils inside. A better tattoo machine gives the artist better, more delicate control. With tighter control, however, there is more room for error. This is why it is so important that the artist has the experience to properly use the machine. 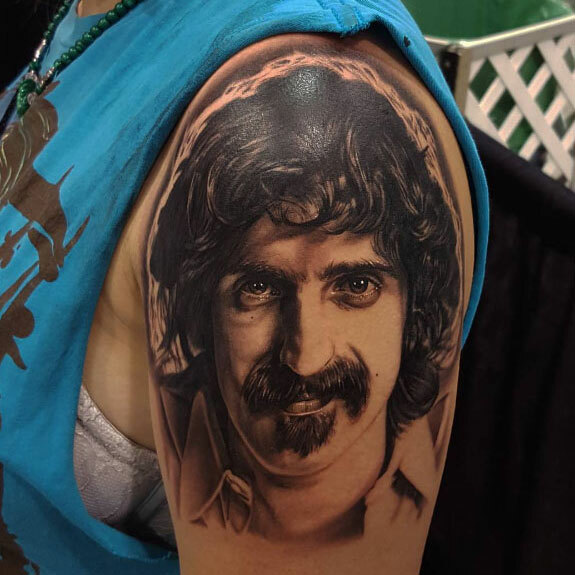 A good shop and artist will only use good quality inks in their work, and will never try to save money on such an important part of a great tattoo. A lesser quality shop may use cheap or even expired inks. 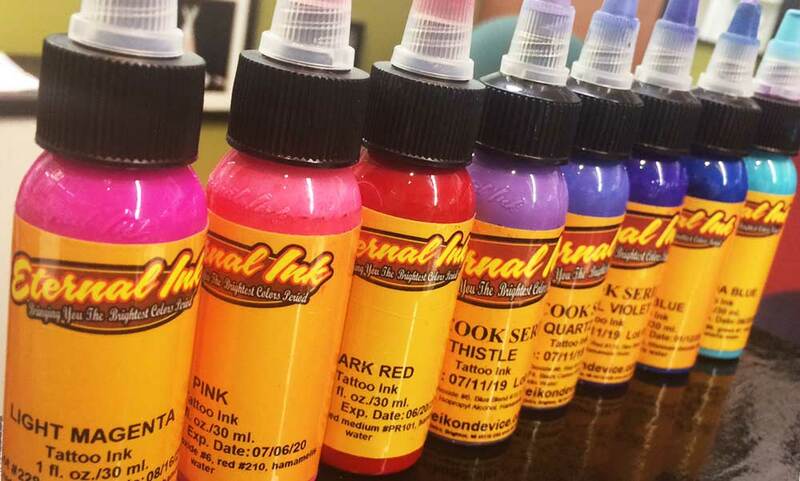 Poor quality or expired inks can not only make for bad looking tattoo, but can also be bad for your health. Cheap or expired inks can contain toxins and even cause infection. Becoming a great tattoo artist requires a great deal of experience. 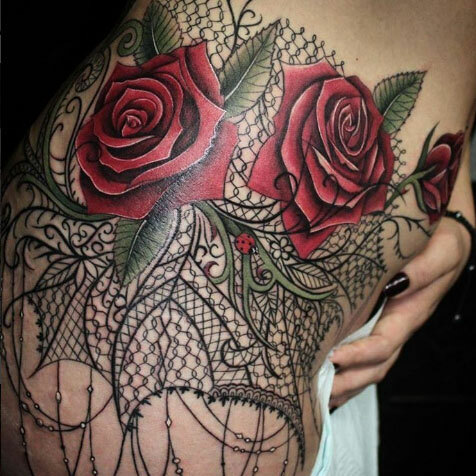 A professional tattoo artist has generally trained and apprenticed with another professional artist and shop. But what makes a good tattoo artist? As with any artist, it is a combination of raw artistic talent, training, and practice. So be sure to look at your artist’s portfolio of work and don’t be afraid to ask about his or her training. A good tattoo artist is dedicated to the craft, which takes years of practice and constant learning to master. 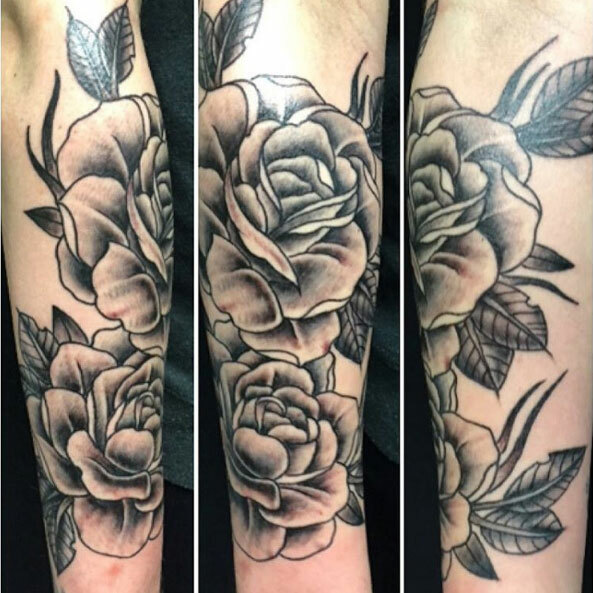 Aside from the technical ability to produce a good tattoo, a professional tattoo artist will also have a good understanding and eye for how a certain tattoo will work on your body. Your artist should be able to properly assess whether or not a tattoo will be appropriate for the place on your body. If not, will have the skill to make the necessary modifications. A great, dedicated tattoo artist is also only interested in doing good work. So if you come in with a bad idea, your artist is not going to be afraid to say no and explain why. A professional would rather turn down the money than do a bad tattoo! So always discuss your tattoo thoroughly beforehand. A good artist will take the time to properly discuss everything and answer all of your questions. Well everyone has to start somewhere, and just because a shop is new, doesn’t mean you shouldn’t go there. But a shop with a history, online reviews, and a presence that you can research will make things easier for you when making your decision. A good shop will have generally have lots of positive reviews and references. This isn’t going to tell you everything, but it is a good place to start. Now that being said, there are many talented artists that have been working for a great shop and decide to go out on their own. And every good shop, was at one time a new shop. So if you really like an artist or a newer shop, just take some extra time to talk to them and ask some extra questions. Getting a cheap tattoo from an inexperienced artist can not only give you a bad result, it can be hazardous to your health. Saving money by getting a cheap tattoo is the not saving anything—it’s simply a waste. The artwork will not likely be up to par, and if the artist uses poor quality inks, it will likely fade and discolour. A bad tattoo will eventually need to be redone, removed, or covered up. Your tattoo will be a part of your body in one shape or form forever. Don’t throw your money away and end up with something that will embarrass you. Get it done right the first time and you will have a piece of art you will be proud to show off for the rest of your life!